Definition and description of a Medieval Merchant: A Medieval Merchant was a a businessperson engaged in retail trade. The word 'merchant' is believed to be derived from the Latin word "mercari meaning to traffic and the French word "mercis" meaning wares. A Medieval merchant would often travel and traffic with foreign countries; a trafficker; a trader. A Medieval merchant would source his supplies and sell them to various customers via shops, markets or Medieval fairs. Most villages and towns in Medieval England were as self-sufficient as possible so it was the more unusual, exotic or expensive goods that a travelling merchant would generally trade in. General Merchants were called Mercers. The Mercers were later restricted to a dealer in textile fabrics, as silks or woollens. The Middle Ages saw the rapid expansion of Medieval trade and commerce in Europe. 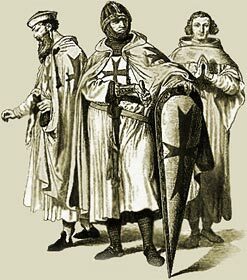 The most important factor in the expansion of trade and commerce in Europe were the Crusades. New trade routes via Italy were opened and the Medieval merchant traded in spices, wine, food, raw materials, furs, cloth, glass, jewels and a whole host of different luxuries. Trade made the Medieval merchants rich and their work also brought wealth to the rulers of the land in which the trading took place as they taxed all traded goods. The bad state of the roads, the little security they offered to travellers, the extortions of all kinds to which foreign Medieval merchants were subjected, and the system of fines and tolls which each landowner thought right to exact, before letting merchandise pass through his domains, all created obstacles to the development of Middle Ages trade and commerce and as a danger to the Medieval Merchant. Due to these dangers and obstacles the Medieval Merchant Guilds were formed. A Merchant Guild was an association of of traders. The Merchant Guild was able to negotiate with the lord and the trade levy became regulated. The Merchant Guilds controlled the way in which trade was conducted in the towns and applied rules to the way in which trade was conducted. The members of the Merchant Guilds became very important members of the Medieval town community. The introduction of the Merchant guilds lead to its own hierarchy and involvement in civic duties. The power of the Merchant Guild members increased and they tended to be wealthier and of higher social status than the members of the craft guilds. The Medieval Times website provides interesting facts, history and information about the life of people who lived during the Middle Ages which scatter the Medieval History books including the subject of Medieval Merchant. The Medieval Times Sitemap provides full details of all of the information and facts about the fascinating subject of the lives of the people who lived during this historical period. The content of this article on Medieval Merchant provides free educational details, facts and information for reference and research for schools, colleges and homework for history courses and history coursework.